Houston Center for Contemporary Craft (HCCC) is delighted to present the ninth edition of In Residence, an annual exhibition celebrating HCCC’s Artist Residency Program, which has supported makers in the field of craft for over 15 years. This exhibition features work by 11 artists working in ceramic, fiber, metal, wood, and mixed media: Susan Budge, Jonathan Clark, Madison Creech, Terry Fromm, Julia Gabriel, Rene Lee Henry, Younha Jung, Wen-Dan Lin, Sarah S. Mallory, Gary Schott, and Carolyn Watkins. The Artist Residency Program at HCCC provides a space for creative exploration, exchange, and collaboration with artists, professionals in the field, and the public. In their open studios, resident artists are able to engage with visitors as they work and explain the processes behind their craft. Though they develop individual bodies of work during their tenure, the collegiality of the program often fosters lines of collective inspiration. This iteration of In Residence features work that pushes materiality and historical forms to new limits. By incorporating digital fabrication, illustration, screen printing, pop-culture references, and found objects into immersive installations of fiber and quilts, Madison Creech’s sculptural works redefine the medium of fiber itself. Ceramicist Carolyn Watkins takes inspiration from folds of flesh, historic ceramic vessels, and how breath fills and leaves the body. Her bulbous ceramic vessels and sculptures subvert notions of utility, while physically incorporating her breath as she applies glaze through an atomizer. Built from an almost 40-year ceramics career, Susan Budge’s monumental abstract sculptures have lustrous surfaces, vertebrae-like interwoven cuts, and soaring forms that illuminate and redefine the spaces in which they reside. Wen-Dan Lin creates intricate ceramic structures that take inspiration from industrial design and architectural forms. His work champions structure over chaos, elevating malleable, organic earth into elegant, fragile forms with total control. Similarly, multi-media artist Jonathan Clark transforms wood, office materials, and found objects into highly complex structures using principles of mathematics, divine proportion, and natural patterning. The sinuous, ribbon-like work of metalsmith Terry Fromm brings a surprising movement and softness to an inherently rigid and unwavering medium through skilled hammer work and forging. Layers of hand-cut paper, patterning, and embroidery unite in fiber and book artist Sarah S. Mallory’s vibrant representations of worlds, both natural and imaginary. Metalsmith and multi-media artist Gary Schott creates humorous kinetic and wearable objects that are activated through various interactions, giving the viewer the ability to wear his brooches or crank the handles of his kinetic machines. Jeweler Younha Jung creates modern, geometric silhouettes from steel, building materials, and found objects that she has collected from construction sites. Her work explores the correlation between site and identity, bringing new life to the discarded artifacts she incorporates, while acknowledging their history and power as relics. The abstracted architectural forms and acid-mottled surfaces of Rene Lee Henry’s jewelry are redolent of the dilapidated buildings and monuments from which she takes inspiration. Her work uses these forms to explore the significance of contemporary ruins. Fiber artist and handbag designer Julia Gabriel also takes inspiration from geometric and architectural forms, using the mathematical principle of the golden ratio to inform her functional designs, which range from rectangular and cubic forms to cones and triangular prisms. In Residence was curated by Sarah Darro, HCCC Curatorial Fellow. 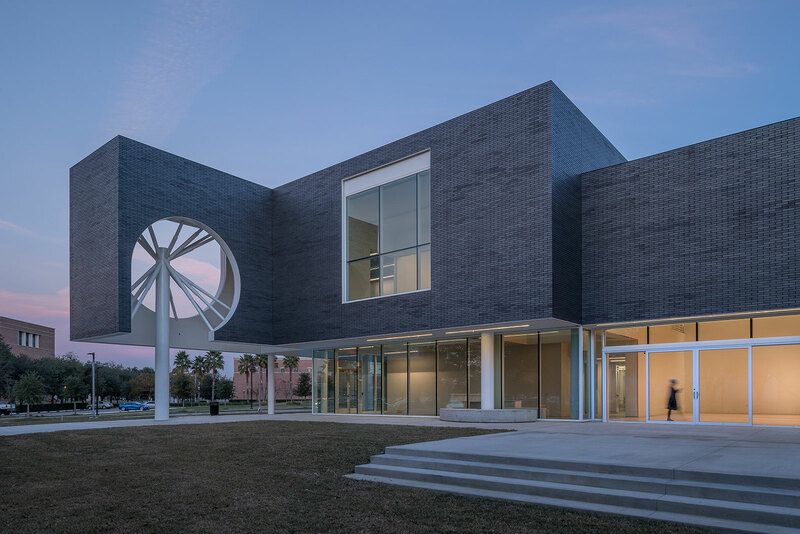 To learn more about Houston Center for Contemporary Craft’s Residency Program, please visit: https://www.crafthouston.org/artists/residents/.